Hi, I'm Chris Shattuck with BuildaModule dot com and in this video I'm going to introduce you to SimpleTest. First of all, I'm going to explain what SimpleTest is. Then we're going to talk about how you would use SimpleTest in practice. Once you've seen it work, you might want to know, "Well, why should I bother with this? What's in it for me?" And we'll talk about that. There are some good things in there. We'll go through the process of installing SimpleTest. There are a few little tricks there that you might need to know. And we'll talk about what happens behind-the-scenes. How does SimpleTest work? We'll go through an example on Drupal dot org on how to build a very simple SimpleTest, what happens when tests pass and tests fail. And finally, we'll discuss some other additional resources for exploring SimpleTest further. So first of all, what is SimpleTest? SimpleTest is a module, first of all, so you'll download it just like any module and install it. But what the module does is that it wraps around an existing testing framework called SimpleTest. So you'll see SimpleTest mentioned outside of the scope of Drupal, but the module wraps it all up so all you need to really worry about is the module. And in its core, what SimpleTest does is it automates browser activity and this is what the virtual browser kind of behind-the-scenes, and then it makes assertions. An assertion, if you're unfamiliar with the term, is a validation of if something is true or not true. So does this exist on a page? is a question that you would ask that's kind of a form of an assertion. So if it is, that's true. You've asserted that it's true. So in the term "SimpleTest," the test part is the assertions that are made after automating some activity in a browser. So how do we use SimpleTest in practice? First of all, we need to install the module just like any other module. Then we need to decide on what we're going to test. And then we write this test or a collection of tests using a dot test file. So just as dot module files are module files and dot info file are info files, a dot test file is the test file for SimpleTest and we would typically put that in the test directory inside of our module. And then we would actually run the test using an administration page on our Drupal install. So let's talk about what's in it for you? Why bother using SimpleTest? Well, SimpleTest allows you to automate some tests that you would normally do in your browser directly, so filling out forms, checking to see if content gets added, checking permissions. So these are all very useful tests that we run to make sure that our code is working properly, but repeating them over and over again means that our tests are going to prone to error and we might not do them as often because they just take up so much time. Another thing we can do is validate output. So does our process actually output what we want it to? So let's go ahead and get SimpleTest set up. First of all, if you haven't seen it already, go ahead and watch the module installation video on BuildaModule dot com. First of all, we're going to download the SimpleTest module. So we're going to go to Drupal dot org slash project slash simpletest, and you can see here there are actually two versions for Simpletest, but only one of them is recommended. So we'll go ahead and download this version. I've downloaded already and add it to my modules directory. This particular version of SimpleTest requires a patched Drupal core. So what I'll do is show you how to apply a patch in the correct place. So if we look at the installation install dot text file on SimpleTest, this will give us some directions. But what we'll need to do is go ahead and copy this patch file and you can tell a patch file because it ends in dot patch. I'm going to go ahead and copy it, and we're going to paste that in our base directory for our Drupal install. And then to apply this patch, what we'll need to do is open up a command line. In Mac you can use the terminal. In Windows you may need to use something like PuTTY. And what we'll use is this command right here, so patch and then a dash p zero and then a lesser than symbol and then the name of the patch. I've already applied this patch. I'm not going to run it now, but when you do, you'll get some output that says that different hunks got applied and that means that the patch was successful. Once that's applied, we're going to go ahead and run some tests just to take a look at what SimpleTest actually does. So I've already installed SimpleTest on this site and I'm going to go to the admin slash build slash testing page. In here you can see there's a bunch of different modules and we can run test on anyone. What I'll do is go ahead and select Administration menu and Run tests just to see what it looks like. So if we run all of the tests all at once, it's going to take a little while. So as you're sort of testing things out on your module, it's good to just select the tests associated with your module. Okay. It ran and it says the test is finished and we had 76 passes and this is all green, green color, which means that everything is good to go. And if we open up these frame sets here, we can see that there have been multiple tests run and each line here is an individual test. So we can just go down the line and read this if we want to understand what's being tested. Okay. So let's talk about what's happening behind-the-scenes here. First of all, SimpleTest is creating a new Drupal install that runs alongside your current one. So it's completely fresh. We don't have to worry about missing with existing users, existing modules or dependencies. It's all set up from scratch. That means that we have to have to explicitly state that certain things are going to happen like modules are going to get installed and users will be created. 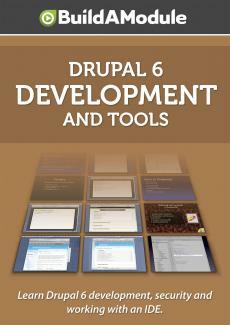 And in the dot test file which includes the test functions, each function usually corresponds to an individual test and the test takes care of setting things up in the configuration and installing modules, creating users and setting any environmental variables for Drupal before the tests are actually run. And then finally, the functions will automate the task that's set for it and then it will validate the results using assertion. So as we've mentioned in the previous slide, the assertions are an example of testing whether something is correct. So does something exist on a page or does this variable equal this particular value? Those are assertions that we're going to use for the test. Okay. Let's take a look at an example on Drupal dot org. There's a great tutorial here and we'll just go ahead and scroll down and follow it without reading it word for word. But what this tutorial will do is allow us to test a very simple SimpleTest with a custom module that has a test that passes and a test that doesn't pass so we can see what happens. First of all, I'm going to click this thing to download the module and then I'm going to install it. But I'll go ahead and skip the installation process. If you're curious how that works, go ahead and watch the how to install a module video. And as a tutorial state, this comes built-in with some tests so we should be able to run these right away. So if I go to Site building testing, I'll see my module Demonstration Tests here and we can check this and go ahead and run the test and see what happens. So here we have the output of the test and just to backtrack a little bit, the module that we're working with here, its main purpose is to create a new content type and the define tests that are being run are can a user with the right permissions create a node of this type and then it checks to see whether a different type of user can edit the node.